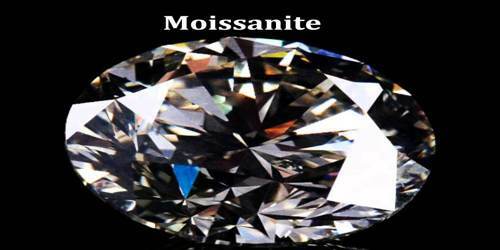 Moissanite is a rare gem that has almost all of the qualities of a diamond. It was first discovered in 1893, with the chemical formula SiC and is a rare mineral, while a scientist was examining meteor samples from a crater in Arizona. Silicon carbide is useful for commercial and industrial applications due to its hardness, optical properties and thermal conductivity. Upon first glance he thought he had found diamonds, but a few years later after some lab testing they were identified as as new spectacular gem. In the 1950’s more samples were found in Russian mines and Wyoming rock formations, but naturally occurring this is a very scarce gemstone. Realizing the potential of this material, scientist determined a way to create it in a laboratory in the 1990’s. Moissanite is not a substitute for diamond, either scientifically, chemically or emotionally. 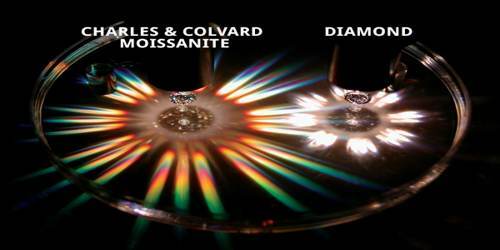 Charles & Colvard created moissanite is a unique gem with its own set of chemical and optical properties that exhibit more fire and brilliance than any other gemstone. Moissanite, in its natural form, is very rare. It has only been discovered in a small variety of places from upper mantle rock to meteorites. Discoveries have shown that moissanite occurs naturally as inclusions in diamonds, xenoliths, and ultramafic rocks such as kimberlite and lamproite. They have also been identified in carbonaceous chondrite meteorites as presolar grains. Years of development have led to a rigorous process for the production of created moissanite, which follows exacting specifications and very high standards of quality control. The Charles & Colvard Certificate of Authenticity certifies that every gem is an original product manufactured in meticulously controlled facilities by highly skilled specialists. Post production, all created moissanite undergoes stringent testing for quality and purity, along with numerous rounds of grading before being released for sale. Analysis of silicon carbide grains found in the Murchison meteorite has revealed anomalous isotopic ratios of carbon and silicon, indicating an origin from outside the solar system. 99% of these silicon carbide grains originate around carbon-rich asymptotic giant branch stars. Silicon carbide is commonly found around these stars, as deduced from their infrared spectra. 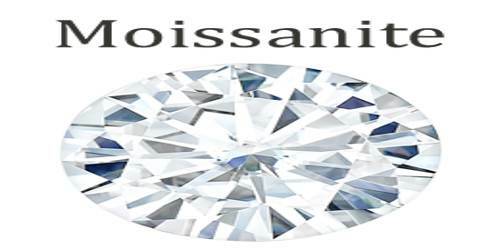 The crystalline structure is held together with strong covalent bonding similar to diamonds that allows moissanite to withstand high pressures up to 52.1 gigapascals. Colors vary widely and are graded from D to K range on the diamond color grading scale. 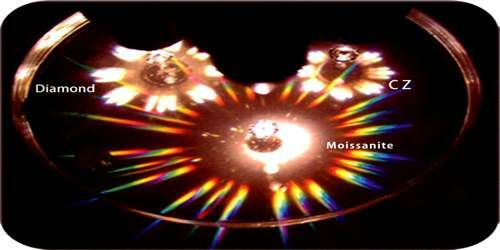 Moissanites touted as “colorless” can still project a yellow or grayish hue in certain lights. Here again, the larger the moissanite, the more noticeable the color and the easier it is to identify it as a simulant. It is engineered to give the illusion of similarity to diamonds, but is compositionally and visually quite different from a real diamond. The durability, brilliance, and color of the two gems are quite distinct. Charles & Colvard is the first company to produce and sell moissanite for jewelry. Almost all of the moissanite stones that are found in engagement rings are created by them. They blazed the trails and now dominate the moissanite market through their brands Forever Brilliant, Moissanite.com, and Lulu Avenue. Thankfully they have not artificially inflated the price like deBeers has done to the diamond market. 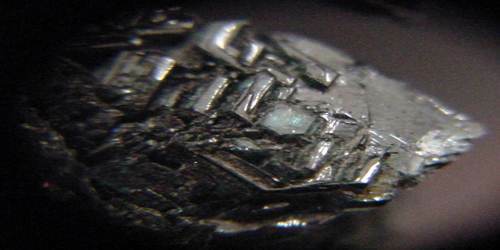 Because of its hardness, it can be used in high-pressure experiments, as a replacement for diamond. Since large diamonds are usually too expensive to be used as anvils, synthetic moissanite is more often used in large-volume experiments. Synthetic moissanite is also interesting for electronic and thermal applications because its thermal conductivity is similar to that of diamonds. High power silicon carbide electronic devices are expected to find use in the design of protection circuits used for motors, actuators, and energy storage or pulse power systems.